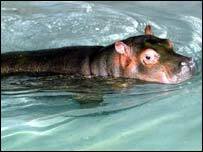 The really clever thing about hippos is that they produce their own sunscreen, in the form of a sticky reddish sweat. It has told Nature magazine the oily secretion is made up of two unstable pigments - one red, the other orange. The red pigment also has antibacterial properties, which work to protect the hippo from certain pathogens and accelerate its recovery from wounds. The hippopotamus - or "river horse" - is a belligerent creature, which puzzled the ancient Greeks by apparently sweating blood. In fact, the thick red substance, which oozes from glands all over its skin, is one of the hippo's many ingenious survival tools. 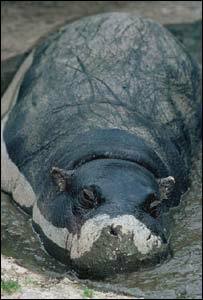 The enormous relative of the pig occupies a unique amphibious niche - which requires some specialised equipment. Hippos consume as much vegetation as they can during the night, when they are shielded from the searing heat and sun. At dawn, they retire into water and spend their days resting, squabbling and, most importantly, digesting. "Hippos are basically fermentation vats," Wayne Boardman, head of veterinary services at the Zoological Society of London, UK, told BBC News Online. "They are adapted to eating poor quality food stuffs, but to be able to get nutrition out of these, they need to be able to eat for long periods of time." Because it is so important for hippos to eat a vast amount, they must venture out in the sun from time to time, to top up on their nightly binge. But a traditional sunscreen - like fur - is not practical if you spend half your time submerged in water. The answer that evolution came up with was an anti-UV secretion, which is at first colourless, then red, then finally brown as the pigment polymerizes. "The sunscreen property of the sweat was first suspected because albino hippos are often observed - and they seem healthy," Kyoto's Kimiko Hashimoto told BBC News Online. This natural skin-care product not only protects the hippo from the sun, it also regulates temperature and discourages the growth of bacteria. Professor Hashimoto and his colleagues collected samples of the hippo's sweat and examined it, to see what makes it so special. They found it is made up of two pigments - one red, called "hipposudoric acid"; and the other orange, called "norhipposudoric acid". The scientists believe these two substances are produced from a metabolite of amino acids (the building blocks of proteins). Both pigments act as sun blocks and the red one, they discovered, is a particularly good antibiotic. At concentrations lower than that found on the hippo's skin, it can inhibit the growth of two types of pathogenic bacteria. This is useful for hippos, because they are terrible fighters. "Hippos are always fighting," said Mr Boardman. "You see them in the wild and they have wounds all over them." Perhaps it is no wonder, then, that evolution endowed them with a handy antiseptic. Mr Boardman added: "They get scratches and bites and cuts and yet they don't seem to get infections."